This allows me to carry out development, testing, and any on-line activity anonymously. was to set up my date/time to my local time zone. I needed to set the time zone on a per user basis. The behaviour of your interactive shell is defined by your ~/.bashrc and ~/.bash_profile files. where myuser is just that, my user name. 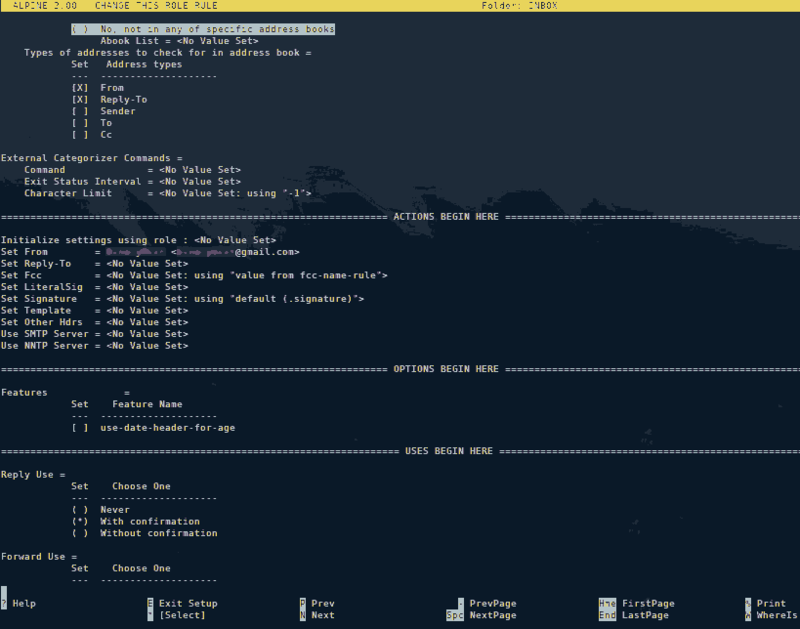 Screen is a Linux shell session manager. all in a single console. Then you can just detatch from screen, leaving your programmes running on it. with your programmes all still running. This is a quick run down on what it is and how to use it. Reattach (-r), do some sizing stuff (a,A), and detach (d) before reattaching if necessary. If your screen session is attached elsewhere, using -raAd will detach that session, and reattach it here. You can kill a screen by typing exit. Where ID is the id of the screen you want to terminate. 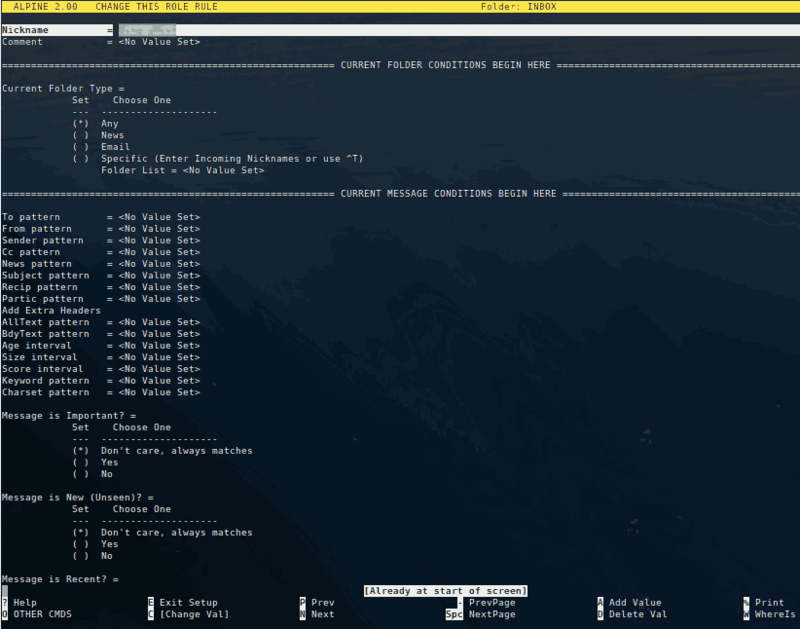 CenterIM is a Linux command line instant messenger client. Assuming you have centerim installed. cd into your .centerim directory and edit the config file. Enter the command mode by pressing the Esc key. This will write and quit. Press F4 for the general menu. 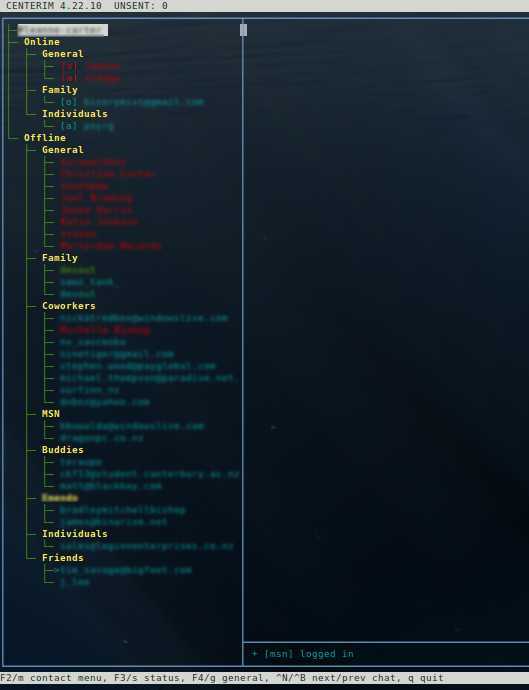 Under the Jab protocol, you will now see the connection details reflected. 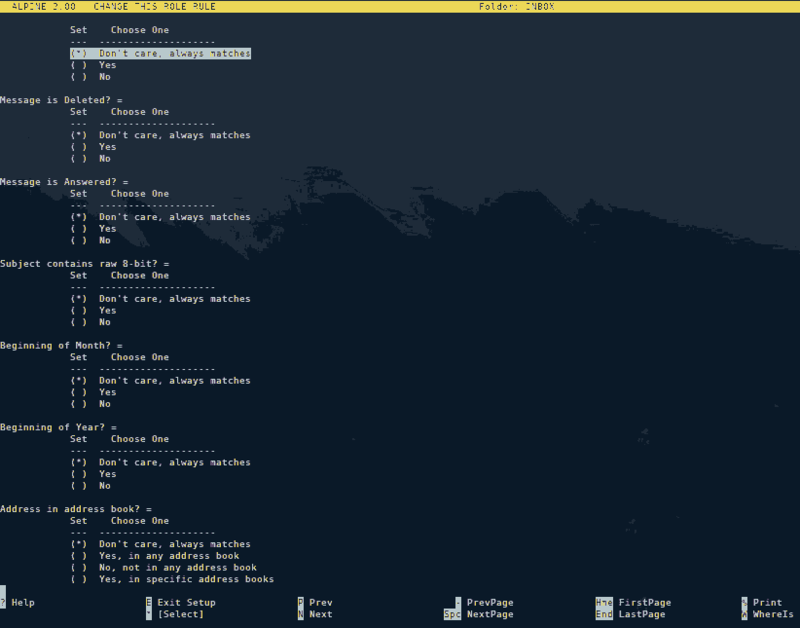 Irssi is a Linux command line IRC client. these are the links I use most commonly. I’ll probably end up adding more to this. 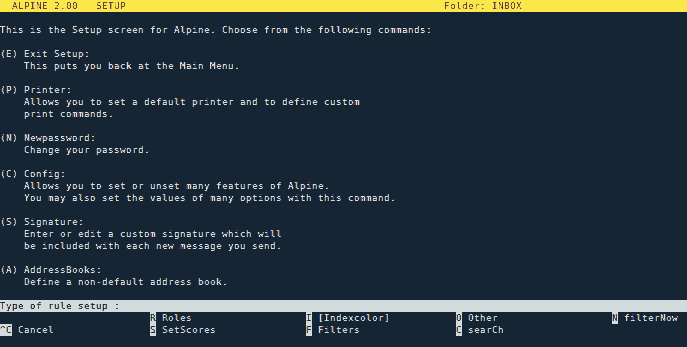 Alpine is a Linux command line mail client. Here is an accurate guide on how to setup your GMail accounts using IMAP in alpine. I used this for my first account setup. you have to do a little bit more configuration. I run all my external shell apps on screen. You should be presented with the Main Menu. save as you did in the initial setup. Your Setup Collection List should look similar to the following. 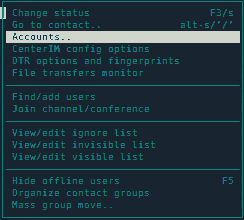 From the Main Menu, press S (Setup), C (Config). Scroll down until you find “Enable Incoming Folders Collection” and turn the radio button on. Press E (Exit), and Y (Yes) to the Commit changes prompt. You should be back on the Main Menu now. Now you need to add a role for each account you’ve just setup. Press S (Setup), R (Rules). Setup each role like the following. Press E (Exit Setup), and Y to the save prompt. Again in the S (Setup), C (Config). I set the following fields, so they show up in new messages you are composing. There are a few ways you can compose a new email message. This depends on where you start the process from. you can press C (Compose). You’ll be asked which role you would like to use to compose the message. each one applies to one of your email accounts. you’ll see a template with the fields you set up before. Select the message you want to move. Press the S (Save) key. If you have multiple email accounts, press Ctrl+N (Next Collection) or Ctrl+P (Prev Collection) to cycle through your accounts. You will be presented with the collection of your email folders for your account. Select Which folder you want to put your message into. Press enter, unless you have to move the message down another level. If this is the case, press ‘/’ (the slash key). Then either the Tab key twice, or Ctrl+X (List matches). This will show you the next layer of folders to choose from. or to go to another level, repeat steps 5 to 8.
you’ll be provided with the path that you are about to save to. Press Enter. The message [Saving DONE] will be displayed. You message is now moved. so that you have moved, not copied the message. You have the option to either copy or move. Select the email and press the ‘;’ (semicolon) key. You will be prompted chose a selection criteria. I selected C (just select current message). When you do this, zoom will come into effect. So you will only see the currently selected messages. You will now see an ‘X’ next to the messages you have multi selected. Press the Z key again to zoom to the selected messages. Press A (Apply), then select the command you want to apply and that’s it. Right click the link and select “Open link”. If you don’t get spell check, you’ll need to do the following. This will tell you whether or not it’s installed. From the Main menu in Alpine, S (Setup), C (Config). You can press ‘W’ to search and type in “spell” without the quotes. The first option you will find should be “Spell Check Before Sending”. You can turn this on if you like. Press ‘W’ again, accept the default, press Enter. You should now see the option “Speller”. Press ‘E’ to exit config. Press ‘Y’ to the Commit changes prompt. You should get a little information about what the -c switch does. This entry was posted on November 27, 2011 at 01:56 and is filed under GNU/Linux, Networking, Scripting, SSH. You can follow any responses to this entry through the RSS 2.0 feed. You can leave a response, or trackback from your own site. Yip. I’m playing with the idea of writing a book currently. Would also look into guest authoring. Where’s your blog?